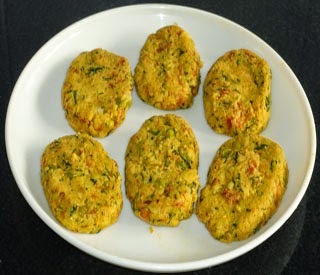 Vegetable cutlet recipe - This vegetable cutlet is a simple shallow fried snack prepared with easily available vegetables like potato, green peas and carrots. 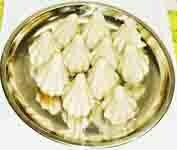 It is a healthy version of snack to serve during the evening with a cup of tea or coffee. Usually cutlets are deep fried. However, to avoid excessive oil, these cutlets are rolled in bread crumbs and then shallow fried using very little amount of oil. Deep fried cutlets are more tastier because of its oil absorption. But, too much oil is not good for health. So, I prefer shallow fried cutlets. 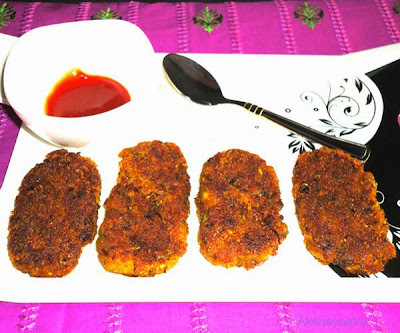 To get more tastier cutlet you can deep fry them by using the same ingredients and method. Heat some oil in a pan and add the onions and green chili to it. Saute till onions become translucent. Add the grated carrot and saute for a minute. Add the garam masala, jeera powder, chilli powder and salt. Mix well. Add the boiled and mashed potatoes and green peas. Soak the bread slices in water and squeeze them gently. Add it to the potato mixture. Add the chopped coriander leaves, salt and then add lemon juice to it. Mix well till all the ingredients combine well. Make a lump of this mixture. Divide the mixture into 10 - 12 equal portions. Flatten each portion into oval shape. Roll them in bread crumbs. Shallow fry till the base become firm and golden brown in colour. Flip and cook till the cutlet becomes golden brown from all sides. Serve vegetable cutlet hot with choice of your chutney or tomato ketchup. 1. Heat some oil in a pan and add the onions and green chili to it. Saute till onions become translucent. 2. Add the grated carrot and saute for a minute. Add the garam masala, jeera powder, chilli powder and salt. Mix well. 3. Add the boiled and mashed potatoes and green peas. Soak the bread slices in water and squeeze them gently. Add it to the potato mixture. 4. Add the chopped coriander leaves, salt and then add lemon juice to it. Mix well till all the ingredients combine well. Make a lump of this mixture. 5. Divide the mixture into 10 - 12 equal portions. Flatten each portion into oval shape. Roll them in bread crumbs. 6. Shallow fry till the base become firm and golden brown in colour. 7. Flip and cook till the cutlet becomes golden brown from all sides. 8. 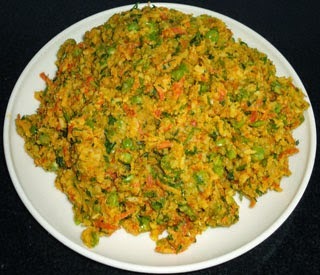 Serve vegetable cutlet hot with choice of your chutney or tomato ketchup. 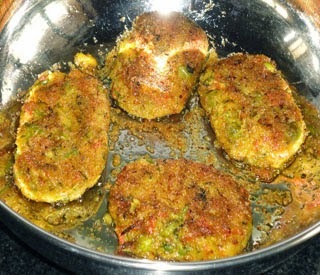 Tempting cutlets perfect fr winter season. 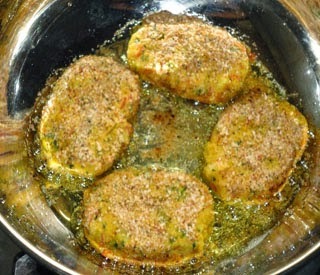 Very crispy and delicious cutlets..